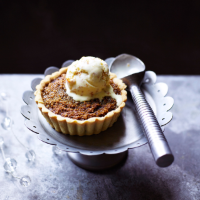 Most of the elements of this dessert can be prepared partly or fully in advance; the finished tarts can happily be reheated as and when you need them. You could also make it as one large 23cm tart. 1. Start by making the pastry. Put the flour, sugar, spice, butter and a pinch of salt in a food processor; pulse to breadcrumbs. Add the egg yolk, 2 tbsp ice-cold water and the lemon juice and mix to bring together. Shape into a ball, flatten to a disc, cover with cling film and chill for 1 hour, until firm. 2. Divide the dough into 8 equal pieces and roll each out on a lightly floured surface to a neat disc, about 0.2cm thick and slightly larger than a 10cm tart case. Carefully line 8 x 10cm deep tart cases with the pastry, trimming off any excess. Arrange the tins on a baking sheet and chill for 20 minutes. Any excess pastry/offcuts can be re-rolled and used to make little stars to decorate. 3. Preheat the oven to 180˚C, gas mark 4. Prick the base of each pastry case and line with scrunched-up baking parchment and baking beans. Bake on the middle shelf of the oven for 15 minutes, until crisp and pale golden. Remove the paper and baking beans and cook for a further 3 minutes. 4. Meanwhile, tip the breadcrumbs and orange zest into a bowl. Gently warm the golden syrup, treacle and double cream in a small pan until runny and combined, but not boiling. Pour over the crumbs and mix in the remaining ingredients, plus a large pinch of flaky sea salt. Divide between the cases; bake for 15-20 minutes, until set. Cool for 5 minutes, then serve warm with ice cream.